The beautiful game, now ultra beautiful! Be the first to experience Premier League in stunning 4K UHD at our selected retail and F&B partners. 4K UHD with 3840x2160 resolution, gives you four times more stunning and clearer view than HD. With a higher frame rate, it gives a smooth and natural viewing experience even if you're watching a fast-paced sequence. Get mesmerise with a richer colour spectrum, up to 1.07 billion colour palettes with 10-bit colour depth. You definitely won't miss any detail! Every detail matters, every goal counts! TAT Radio & Television CO.
WAH LEE CHAIN-STORE SDN. BHD. 2626-2628, GR. FLOOR, JALAN MAJU, MAJU JAYA, 14000 BM, PULAU PINANG. 1977, JALAN BERTAM, KEPALA BATAS, 13200 KEPALA BATAS, PENANG. BAN HUAT ELECTRICAL S&S S/B. 400, JALAN PAKU LIMA, KAMPUNG BAGAN AJAM, 13000 BUTTERWORTH, PULAU PINANG. 288B-1-10 & 11 GROUND (FORTUNE COURT), JLN THEAN TEIK, 11500 FARLIM, PENANG. SYARIKAT HOE HENG ELECTRONIC SDN. BHD. ONKING CHAIN-STORE (MALAYSIA) SDN. BHD. SENHENG ELECTRIC (KL) SDN. BHD. NO 10-G, JALAN WAWASAN AMPANG 2/8, BANDAR BARU AMPANG, 68000 AMPANG SELANGOR. NO 24 & 29, JALAN KIJANG BATU 9, TAMAN SUNTEX, BATU 9 CHERAS, 43200 SELANGOR. NO 15, JALAN KIJANG SATU, TAMAN SUNTEX, BATU 9 CHERAS, 43200 SELANGOR. SOH SALES & SERVICES SDN. BHD. Watch this space, new locations weekly! to get the latest 4K UHD updates and future offerings. Oops, there was a problem submitting your form. Please take a look at the fields highlighted in red below. Wrong Recaptcha entered. Please try again. 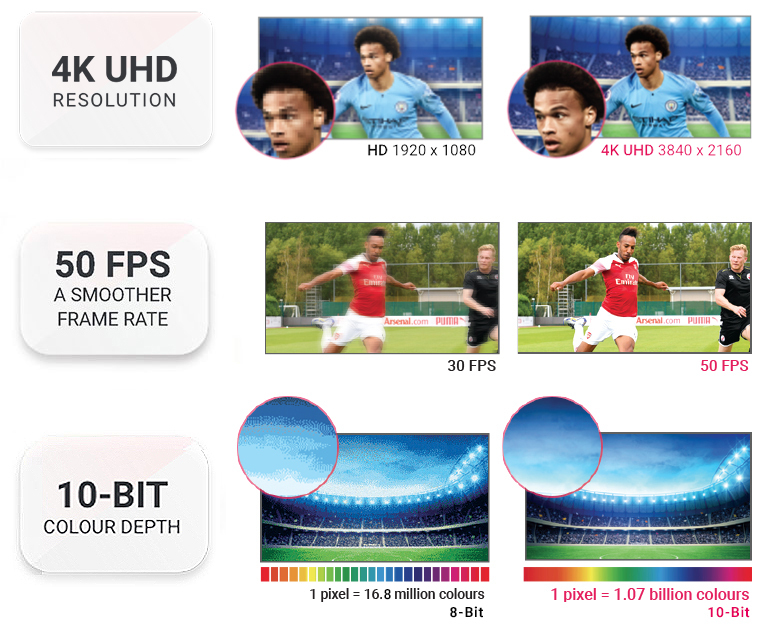 4K UHD will offer you the most vibrant colour television experience possible, 4 times the resolution of HDTV (4K UHD has 3840x2160 resolution with 8 million pixels compared to HD which has 1920x1080 with 2 million pixels), sharper detail, smoother lines and a richer colour palette. How can I experience the 4K UHD service from Astro? Astro is working with our partners to showcase 4K UHD at selected retailers and F&B outlet. During the showcase period, you may enjoy selected Premier League matches & FIA Formula1 racing events live in 4K UHD at the F&B venues. Participating outlets and the 4K UHD broadcasting schedule will be available here. I would like to subscribe to Astro’s 4K UHD service. How can I do so, and how much will this service cost? Astro’s 4K UHD services is not commercially available yet. To watch Astro’s 4K UHD broadcast, customers will require a 4K UHD set top box from Astro, to be unveiled later this year. However, Astro’s 4K UHD service is available for preview at selected 4K UHD showcase locations with our partners. 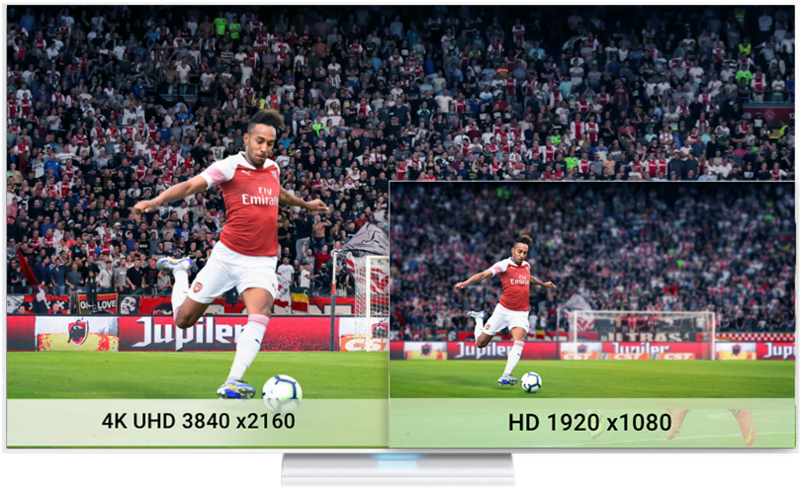 You may register your interest for 4K UHD from Astro here, and we will keep you updated with the latest news and availability on the 4K UHD services. Do I need a new TV to enjoy this 4K UHD service? Yes, customers are advised to upgrade to a 4K-UHD TV with a size of 55” and above to fully immerse in the 4K UHD viewing experience. Without a 4K UHD TV, customer may be only able to enjoy HD services despite having access to Astro’s 4K UHD service. When will Astro’s 4K UHD services be commercially available? You may register your interest for 4K UHD from Astro here , and we will keep you updated with the latest news and availability on the upcoming 4K UHD services and 4K UHD set top box. What are the 4K UHD content that will be available during the commercial release? Astro will be rolling out an array of content line up including live sports (selected PL matches & FIA F1 racing events), movies and general entertainment in 4K UHD.